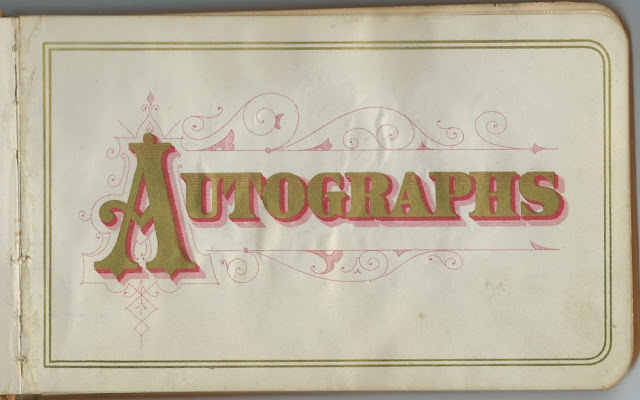 1880s autograph album that belonged to Cynthia E. Burke of 117 Bathurst Street, Toronto, Ontario. The album is approximately 6-1/4" x 3-3/4" and contains the sentiments of 52 of Cynthia's relatives and friends. An alphabetical surname list and an alphabetical list of the signers, together with any personal information they offered, appear at the end of this post. Cynthia E. Burke was born about 1858 in Ontario, the daughter of Asa and Sophronia Frances (Demaray/Demarest) Burke. I found a reference online to a letter written by Sophronia about the death of her husband Asa, with information on how his parents had moved from the United States to Ontario. Search this document for the surname Burke. Sophronia inscribed a page in daughter Cynthia's album at Stayner, Ontario, on April 16, 1883. 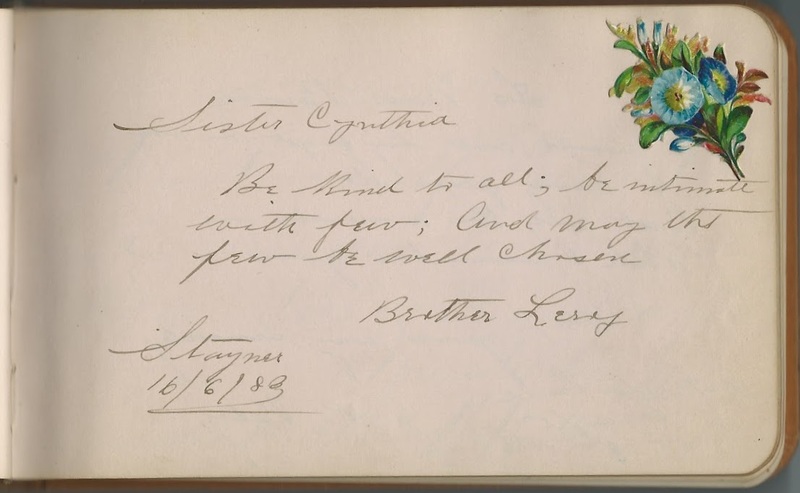 Three of Cynthia's siblings inscribed pages in her album. Sister Asenath Merib (Burke) Boomer, wife of Isaac Evans Stewart Boomer, signed a page at Stayner, Ontario, on July 24, 1883. Her daughter Minnie Boomer also inscribed a page. Cynthia's brother Asa Leroy Burke, "Leroy", signed a page at Stayner, Ontario, on June 16, 1883. 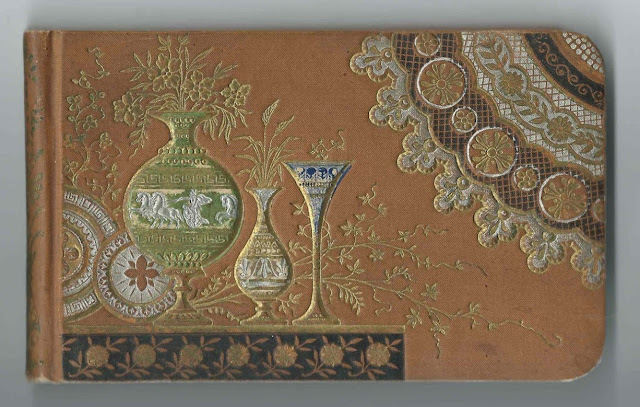 He applied a Victorian scrap to his page. The Mary C. Burke who inscribed a page at Stayner, Ontario, on July 22, 1883 may have been Leroy's wife Mary Cynthia (Herring) Burke. Cynthia's brother Cleophas Stewart Burke and his wife Janet (Dunlop) Burke inscribed pages in 1884 when they were living at Albion, New York. Cousins W. Newell and May Newell, who gave their address as 113 Sherbourne Street, Toronto, Ontario, on the pages they signed on June 2, 1885. Niece I. C. or J. C. Amis of Kingston, Ontario, who signed a page on February 24, 1884. I lost track of Cynthia after the 1881 Census of Canada when she was living at Nottawasaga, Simcoe North, with her parents and older sister Harriet and making her living as a dressmaker. 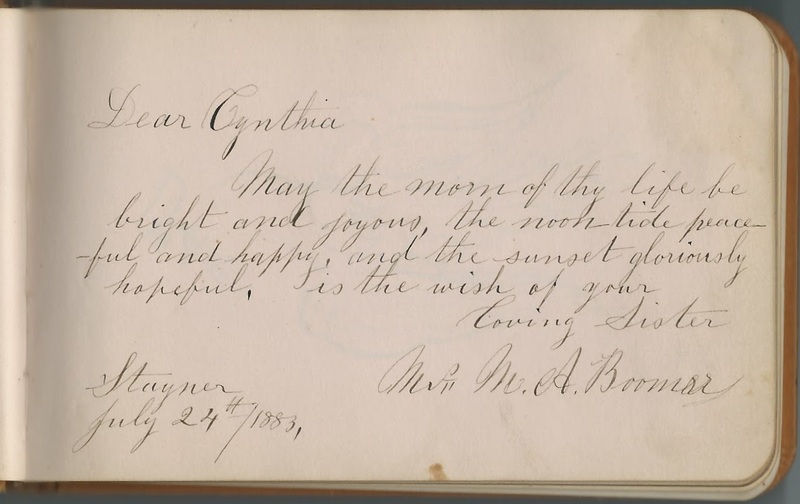 Evangelist Charles Wiley Martz and wife Sarah E. (Clemens) Martz of Indianapolis, Indiana, inscribed pages in Cynthia's album, presumably while Rev. Martz was pastor at Ridgetown, Ontario, or while he was on a visit where that opportunity was offered to him. Mississippi Street is now known as Senate Avenue. W. Amis; middle initial possibly G or C.
Mrs. M. A. Boomer, signed at Stayner, Ontario, on July 24, 1883; "loving Sister". She was Asenath Merib (Burke) Boomer, wife of Isaac Evans Stewart Boomer. Minnie Boomer, signed at Stayner, Ontario, on June 11, 1884. She was the daughter of Isaac Evans Stewart Boomer and Asenath Merib (Burke) Boomer, Cynthia's sister. Miss C. E. Burke, 117 Bathurst St., Toronto, Ontario; album owner Cynthia E. Burke. She wrote her name on the first end paper; she also inscribed a page of welcome to the future signers in her album. Mrs. C. S. Burke of Albion, New York, on September 15, 1884. Janet (Dunlap) Burke, wife of Cynthia's brother Cleophas S. Burke. C. S. Burke of Albion, New York, signed on December 29, 1884. Cynthia's brother Cleophas Stewart Burke. Mrs. Lizzie C. Gard, signed at Stayner, Ontario, on March 9, 1883. She gave New Point, Indiana, as her place of residence. William M. Gard of New Point, Indiana, signed at Stayner, Ontario, on "3-8th-1883"
J. Kelly signed at McMaster Hall, Toronto, Ontario, on November 26, 1885. Middle initial might be W. or H or ? Ella M. ? of Brampton, Ontario. Surname possible Leetie or Leeble or Little or ? James ?, signed at Ridgetown, Ontario, in December 1887. Surname might be Led? or Leaman or ? Annie L., signed at Toronto, Ontario, on May 3, 1885; middle initial might be W or ? G. Martin, signed at Toronto, Ontario, on July 27, 1885; middle initial might be H or U or ?